Laguna Beach High School is accredited by the Western Association of Schools and Colleges (WASC), one of the six United States regional creditors. 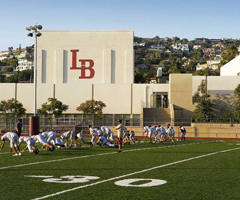 Students transferring credits onto the Laguna Beach high school transcript must have credits obtained at a school site with a regional accreditation. The accreditation agency must have authority over K-12 schools and is validated through the Unified States Department of Education. High school credits from all coursework in the United States on any prior transcript will be transferred onto the Laguna Beach high school transcript in accordance with District and School practice as well as California State Law. Transfer students are held to the same policy for honors courses in which their graduating cohort year is awarded. Coursework completed from a school site that awards an additional weighed point to courses may not be awarded the same additional weighted point value at Laguna Beach high school. In the event that Laguna Beach high school does not offer an exact match for honors course curriculum taken at another school, Laguna Beach high school cannot acknowledge the honors credit. The high school transcript will acknowledge the course name as honors, however the course will not be awarded any additional weight. The student’s prior grade point average will not be identical. Transfer students from outside the United States and those students who participated in an international secondary school will have transcript records that are mixed by UC/CSU standards. UC/CSU does not accept “pass along credits” or credits based upon Laguna Beach’s interpretation of prior credits. These students will be required to submit both their international transcript and the transcript at Laguna Beach High School for college admissions. Laguna Beach may limit international transfer credits to meet high school credits only if the recommended international educational credential evaluation is not provided.